Gemma began riding as a child, and continued into her teenage years. After an extended absence, she began riding again as an adult in 2006. 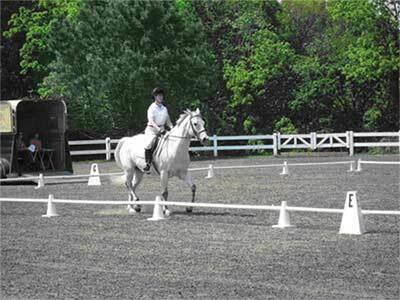 She started in the hunter world, and has since changed her focus to classical dressage. She has studied with Denise Rugen, Johanna Gwinn, Susan Neilson, Lori Peacock and Kim Taylor. In addition, in 2009 she expanded her training with clinics in Downunder Horsemanship, the natural horsemanship method of Clinton Anderson. More recently in 2012, she began studying Parelli Natural Horsemanship with Jane Bartsch. Gemma believes Pilates can be of great value to riders, helping to improve strength, flexibility and balance. The Pilates Method can bring a world of body awareness to riders, and benefit riders of all disciplines. Gemma would like to share her Pilates expertise with riders, and invites any equestrians interested to contact her to find out more about how their equine passion can benefit from Pilates. The core muscles are the deep muscles of the back and abdomen which provide a girdle of support for the spine and torso. Their support also allows for use of more than one muscle group at a time, and separation of muscle use. The ability to use separate riding aids independently is important for correct communication with the horse and to maintain proper alignment to eliminate stress created from overuse of the arms, legs and shoulders.